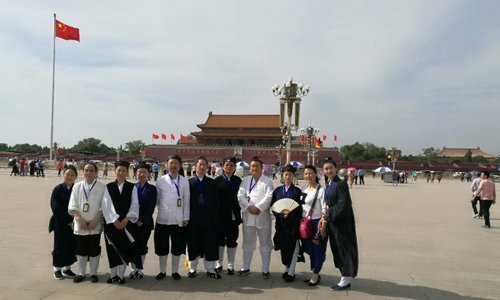 For Liang Xingyang, a 39-year-old Taoist priest who lives in the Temple of the Golden Immortal in the Zhongnan Mountains, Shaanxi Province, the past week in Beijing has been both a hectic and honorable experience. Liang has been participating in a one-week training at the Central Institute of Socialism, the Communist Party of China (CPC)'s Party school for non-Party members. 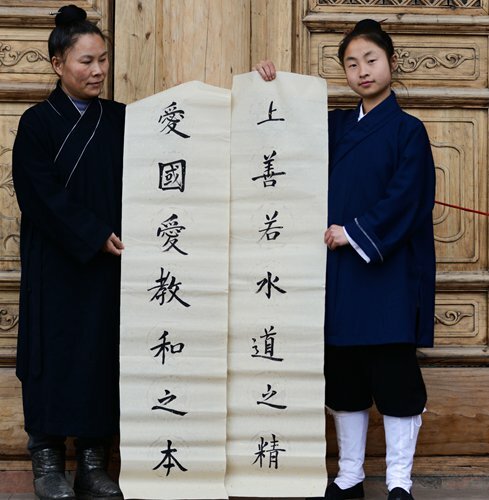 Entitled "Class to merge of Taoism and Core Socialist Values," the training included courses on China's religious policies, the responsibility of Taoism in the age of religious sinification and lectures on China's New Era and the Belt and Road initiative. Most of the attendees, according to Liang, were Taoist abbots and officials at local Taoist associations. The sinification of religions was highlighted in China's newly revised regulation on religious affairs, which took effect in February. "Some people think that Taoism, as a native Chinese religion, does not need to be sinicized. There is a misunderstanding: What is the real meaning of sinification? It means following up the development of China in the new era, digging into religious elements that are in line with core socialist values," he told the Global Times. There are a lot of elements in Taoism that are in line with socialism with Chinese characteristics, Liang said, such as its respect of natural order and pursuit of harmony. "There is no afterlife or heaven in Taoism. Instead, Taoism wants to focus on the current life and turn the current world into heaven. This is in line with the development of China," he said. However, he added that superstitions in Taoism, which are not in line with core socialist values, should be eliminated. Taoism is not the only religion that has gone through a sinification makeover in recent years. According to the website of the Central Institute of Socialism, it has been holding courses for priests from every major religion including Buddhism, Catholicism, Protestantism and Islam. Similar trainings are also held extensively at the provincial or city level, by local administrations of religious affairs in recent months. This was not Liang's first time participating in such events. Over the past few years, Liang, known as "the patriotic Taoist" on Chinese microblogging site Sina Weibo, has waved Chinese national flags on the Xisha Islands in the South China Sea, changed into military uniforms during drills and has been voicing vocal support of China in international disputes. Although Liang's actions and words are not without controversy, his followers have been increasing online. He said more Taoists now agree with his stance. "Previously, a lot of fellow Taoists thought priests should not be involved in politics. But now, as the social environment has changed and as the government puts more emphasis on patriotism, more and more Taoists identify with me. Some who used to oppose me are now embracing patriotism online," he said. Taoists are not alone in receiving patriotic training. In April, over 70 Muslims from Xinjiang Uyghur Autonomous Region participated in a two-week patriotic training organized by the Central Institute of Socialism. They visited religious and revolutionary sites in Jiangsu, Shanghai and Fujian and exchanged experiences on sinicizing Islam in China. In Shanghai, they visited the site of the First National Congress of the CPC. "Without the hard work of the Communists, today's happy life and powerful country would not be possible. Nor would it be possible for us to discuss this peacefully here today," one attendee said, according to the official WeChat account of the Central Institute of Socialism. A course targeting young Catholic patriots and a training involving Living Buddhas of Tibetan Buddhism from Sichuan and Qinghai provinces and the Tibet Autonomous Region was also held in the institute in April. Many churches in China are also rolling out their own plans to execute the sinification of their own religion. This march, the National Committee of Three-Self Patriotic Movement of the Protestant Churches in China (TSPM) and the China Christian Council (CCC) started the execution of its five-year plan on the sinification of Christianity from 2018 to 2022, according to the official websites of TSMP and CCC. According to the plan, it will increase the level of sinification of Christianity, including digging into contents in the Bible that are in line with core socialist values, then turning them into easily understood reading materials. It will also endeavor to increase the proportion of core socialist values, patriotism and Chinese history into the curriculum of China-based theology institutes as well as promote Chinese elements in preaching, religious poems and songs, clothing and church designs. Core socialist values will also become a major part of Christian preaching, and trainings of preachers will be organized. According to the website of China Islamic Association, in May the China Islamic Association launched a campaign called "Four Entries," namely the entry of national flag, the Chinese Constitution, core socialist values and traditional classical Chinese culture in mosques. According to a declaration by the China Islamic Association, all mosques in the country should raise the national flag and study core socialist values to carry forward "the spirit of patriotism." "China's Islamic circle should use its scriptures and classics to explain the profound meaning of core socialist values," Yang Faming, who heads the China Islamic Association, said at the opening ceremony of the campaign. In terms of Tibetan Buddhism, the Tibetan Buddhism Institute will hold five training classes targeting Tibetan Buddhist monks from remote areas from 2017 to 2022, according to a report by the China News Service. Politics will be the main emphasis of the course, the report said. Catholicism in China is also preparing a five-year plan of the religion's sinification to guide local churches, according to Ma Yinglin, chairman of the Bishops' Conference of the Catholic Church in China, the China News Service reported last September. Its training of Catholic priests, however, aroused controversy this month after a public account called Gongjiao Fuchuantuan on WeChat published several photos of bishops from Shandong Province dressed in Red Army uniforms in Jinggangshan, known as the "cradle of the Chinese revolution." The authenticity of the photos has not been verified. The operator of the public account told the Global Times that the photos were sent to him recently by his Catholic friends, but declined to provide further details. 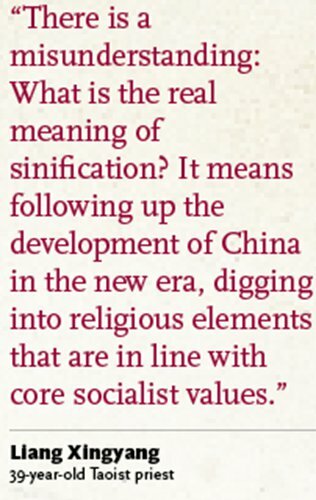 Wang Meixiu, a research fellow at the Institute of World Religion Studies of the Chinese Academy of Social Sciences, said Christianity has always embraced "localization" in history so as to better approach the local community. China issued a white paper on religious freedom in April. According to the white paper, titled "China's Policies and Practices on Protecting Freedom of Religious Belief," which was issued by the State Council Information Office, there are around 200 million religious believers in China, including 6 million Catholics, 38 million Protestants and 10 ethnic groups with a total population of over 20 million, the majority of whom are Muslim.